Hawkers Market Girls Centre (HMGC) is a community based organisation that works in partnership with other organizations to enable girls and young women to develop their fullest potential by providing them with both vocational and life skills. 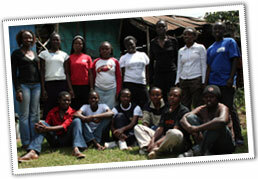 The girls who come to the center are from the slums surrounding the city of Nairobi. In the slums there is no fresh water, no space and no sanitation. HMGC is there home away from home. HMGC provides safe water, free food and free education. HMGC has dedicated mentors who love, care and support the girls. The girls who have passed through this center have responsible jobs, are educating their siblings have moved to better living conditions and some have come back to mentor other girls in turn. ARE YOU LOOKING FOR A GIFT ITEM OR A BAG? Want to know how to help us?